You can tell the President - and please use these exact words - "He's not my boss and he's certainly not turning this into a war!" Har’et is, well, a rather unassuming woman to look at her. She's of around average height and build, with mousy brown hair liberally sprinkled with silver-grey strands. Her medium-brown eyes are lined with creases she didn't have a decade ago, and her lips are thin and often drawn into a rather severe expression. Her mode of dress is on the conservative side, in dark colors and high collars, though since Impressing she’s favored trousers over skirts. Her shoulder-length, slightly wavy hair is fastidiously neat, as is her clothing. She looks, quite frankly, like many other middle-aged women. That's not, of course, taking into account her voice, which is strong, bold, and quite capable of piercing through the noise of a crowd. Despite not having the most memorable of appearances, Har’et is a difficult woman to overlook. She’ll make people notice, if she has to. To call Har’et stubborn is an understatement. She is practically a force of nature when she wants something done, and it’s doubtful that there’s a power short of death that could stop her from trying to get her way. She’s incredibly ambitious, though the circumstances of her birth have halted many of her opportunities at the Hold; now at the Weyr, she is quite intent on finding her way into power and influence. Despite this admittedly self-focused ambition, she truly cares about other people, and is more than happy to use her stubbornness to be an advocate for other people who might not necessarily stand up for themselves. She is, of course, an advocate for whatever she happens to care about at the moment. Be that warmer blankets for the creche, getting hot meals brought up to her when on watch in winter, or trying to convince their Weyrwoman not to go to war, she will fight for it. She isn’t afraid of rules and regulations trying to stop her; in fact, she practically relishes the challenge of getting around them and accomplishing her goals despite them. Having spent so much of her life independent and able to make decisions for herself, she’s not especially good at giving due deference to those who are now in charge of her, both Wing and Weyr leadership. She finds it especially difficult to follow a Weyrwoman young enough to be her daughter, and doesn’t really consider Tuckal her boss at all. Harniet, the daughter of a pair of crafters living at Fort Hold, was always expected to make something of herself. From a young age she was told she needed to do something, and that if she put her mind to it she could be anything she wanted to be. Her parents expected her to choose a craft; she settled on wanting to be Lord Holder when she grew up. She was quite disappointed when she learned that wasn’t something she got to choose, and was told to pick something else to be. In the end, she chose to become a seamstress. Not because she had the slightest interest in the work—in fact, she found it dreadfully boring—but because she knew that seamstresses got to interact with everyone. Everyone needs clothes, and the powerful were surprisingly likely to speak freely while their clothing was being fitted. She learned all the gossip she could, but was never really able to do anything with it. She wasn't very good at being satisfied with her life. Her childhood dream still lived on, though never spoken as she passed the Turns in relative monotony. She wanted to lead, to be Lord Holder, to make a difference and leave her stamp on the world. She wanted to be remembered someday. But she couldn't achieve that dream. Vellat was murdered, and Evander came to power, and she was convinced, she knew she was more suitable for the job, she just hadn't been a part of the right family. At least she was good at what she did. Shortly before Evander cut off the freedom of the Hold folk to travel, she'd received an order from a greenrider: make her a dress for the Hatching Feast. Her son was a Candidate, apparently, and she wanted to have something nice to wear in case he Impressed. And if he didn't, well, she'd still have something nice to wear. Harniet couldn't say she was happy to oblige, since she thought there were far more interesting things she could be doing, but she made the dress anyway. The rider stopped by several times for fittings; she was near Harniet's age, and the two got along well. When the dress was done, the rider invited her to watch the Hatching. She claimed it was as thanks for a job well done; Harniet was beginning to suspect it was for another reason entirely, which wasn't too horrible a thing, really. The rider was sweet, and she did rather like her. The Hatching, unfortunately, was not really what Harniet expected. It was bloody, and violent; a brown hatchling savaged a girl and somehow nobody did anything to the hatchling, who had certainly seemed as though he'd done it with every intent of hurting her. 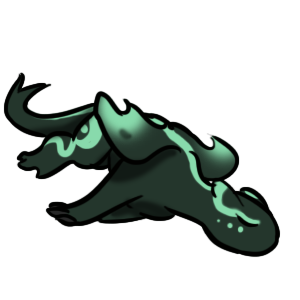 And in the midst of it all a little green, wobbly on her long legs, stumbled up into the Stands, her head ducked low as she tried to both make her way through the crowd and avoid people at the same time. The green was heading for her. She gave a little squeak, and pulled her wings tightly about herself as though trying to hide from all the eyes on her. Har'et. Kisinateth. Being a Weyrling with people young enough to be her children was beyond strange. Sending letters back to the Hold to inform those she'd worked with that she wasn't returning, and telling them the reason why, was even stranger. But still, the pair made it through. Somehow. And slowly, Har'et began attempting to insinuate herself into the Weyr's politics. Back at the Hold, a mere seamstress had no bearing on things. But at the Weyr? Even a greenrider could have a voice, and she was determined to use hers. Kisinateth may not be a dragon, but an extremely strange baby deer. Maybe. She has long claws and webbed feet, but her limbs are all very long. She looks like she got splashed with almost every color of green, or has a very effective natural camouflage. She is spots and streaks and patted patches of bright spring greens, little bursts of mint greens, and splashes of yellow-greens to grass greens. She could probably hide in forests and be perfectly hidden for days. She almost looks like sunlight is shining through the trees down at her, and she is most definitely beautiful. Very rarely will Kisinateth speak to any who are not her rider. This is not due to anything other than her shy nature. Those who are graced with a word or two from her will notice she has a light and musical voice, sweet and almost ethereal in tone. Under a beautiful hide and a fierce figure lies the heart of a creature afraid of the world. 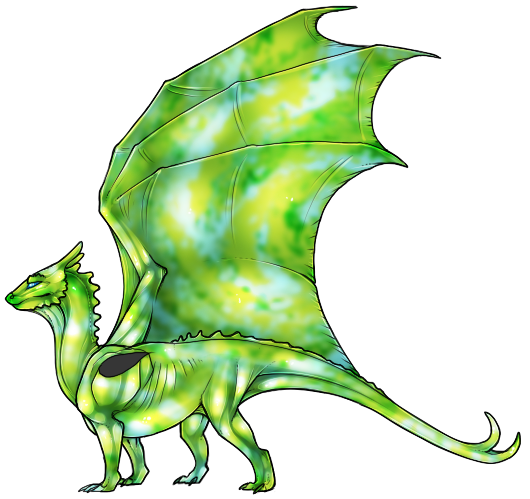 Kisinateth is very unlike a majority of her siblings in that she is quite timid, especially for a dragon. There is something of a little lost kitten in this large winged beast, as if she is truely unaware of the might and majesty she could possess. In the face of the new or unknown she is far more likely to withdraw, retreat and try to remain unnoticed. Kisinateth is a quiet creature for her size and is well adapted to moving with minimal noise. In her adulthood her greatest advantage will be that she is able to get around in near perfect silence. Kisinateth also has an unusual habit, one that may or may not fade as she ages. To those she is close to, especially her rider, this green is likely to "duckling" after, following them whereever they go to the point of running in to them if they were to suddenly stop. When her rider is unable to remain close one might find this little green attached to her brown or blue siblings, whom she is likely to create a strong bond with.